This 32oz Hardwood and Laminate Floor Cleaner is made by Bruce Flooring Company, the hardwood flooring experts! This hardwood and laminate floor cleaner was previously called Dura Luster. This hardwood and laminate floor care cleans all Bruce Flooring along with other no-wax hardwood and laminate floors. Its unique formulation can be used to revitalize flooring surfaces, lifting soil from the surface and leaving them residue-free and glowing. This product is great for routine cleaning and spot cleaning. Caution: Do not allow puddles of cleaner to remain on floor. Do not use on wax finished floors. To Remove Spots Caused by Food, Water, Animals, Grease, Ink, Rubber Heels, Crayon, etc. - Apply Bruce Flooring Hardwood and Laminate Cleaner to a Clean Cloth. - Rub the area to remove the stain or spot. - Fill a sealed plastic bag with ice and set on top of the gum or candle wax deposit. - Wait until deposit becomes hard and brittle. Carefully remove. - Clean area with Bruce Flooring Hardwood and Laminate Cleaner. Taking care of your hardwood and laminate floors is easy with the right maintenance products. 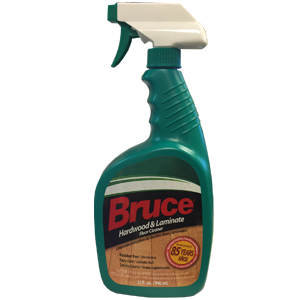 Order your Bruce Hardwood and Laminate cleaner today.